Somehow, the promise of what lies within is almost always overestimated when it comes to quesong puti wrapped in fresh banana leaves. 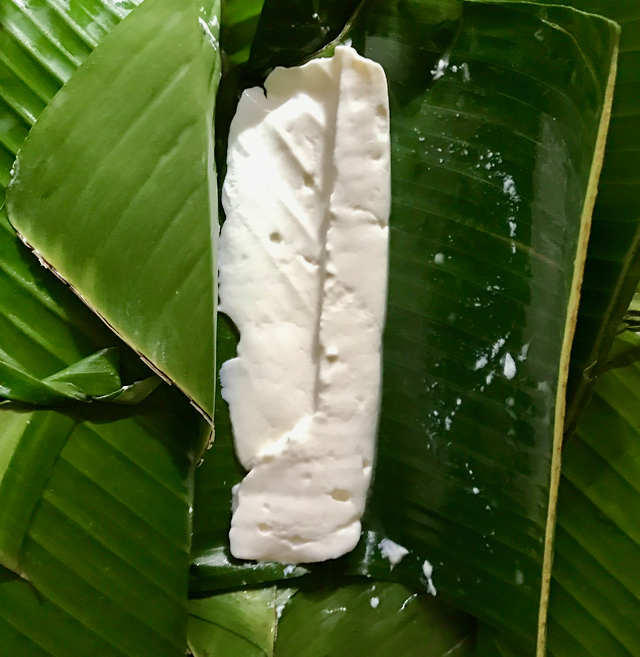 It seems as though the more layers of banana leaves that enrobe the simple, soft, briny white cheese made from carabao’s milk, the more likely you are to get a puny portion of the native delicacy. Gone are the days when 500 gram squares of cheese could be had for a reasonable sum. Knowing all this, I bought three parcels at the market today, for PHP40 each. 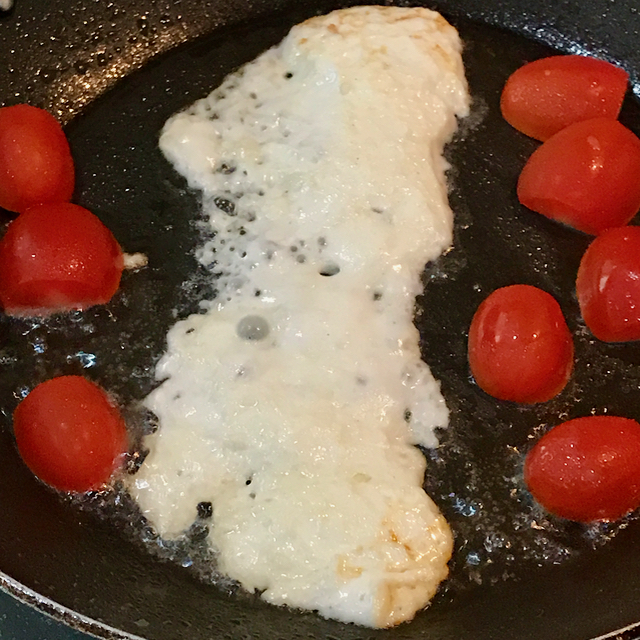 Back at home, for breakfast, I fried up one portion of cheese and added some halved grape or cherry tomatoes to the pan and watched it sizzle. I could immediately hear my mom’s voice somewhere out there saying “you have to fry it to kill the cooties…” which just seems a bit ridiculous, doesn’t it? But then again, we have ALWAYS fried it, despite the fact that I have tasted it “unfried,” soft and unctuously simple (an oxymoron) and I never gotten sick or died of hepatitis. 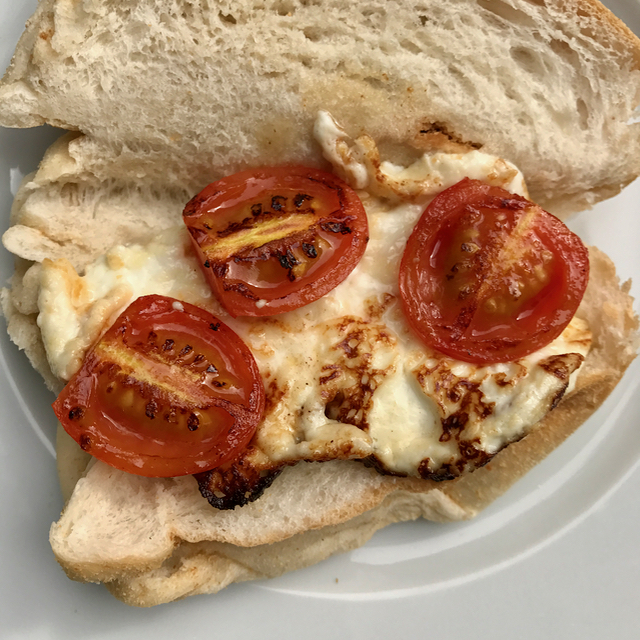 Tucked into a large pan de sal that was still warm (from the bakery on the way back home), this was a really pleasant surprise, what I called my “Pinoy Caprese” if you will. Totally hit the spot. But ever so annoyed by the shrinking portions of cheese within the leaves, I weighed two portions and found out they were just 50 grams of cheese each, or the equivalent of a whopping PHP800 a kilo, the price of decent mozzarella that has traveled across continents to make it to the local grocery or deli! Yes, why is that? Why is a local artisanal product with just one or two middleman from producer to buyer, made with local ingredients, purchased at a market, just as expensive as it’s imported counterpart? Oh well, I’ll just have another sandwich instead of worrying about it too much. The quesong puti size is directly proportional to the pan de sal size. It takes a lot of milk to make cheese. Perhaps there aren’t that many carabaos anymore to milk with more agricultural/pasture lands lost to residential or commercial development. Anyway, sounds a pretty stiff price to pay for a local delicacy. If cooties is a problem then maybe you should try the quesong puti of Holly’s Milk from Jun Magsaysay’s farm. I don’t remember how much it is but they sell it in 200 gram squares in Centrum II building along Valero Street near the Salcedo market. Just ask the guard assigned in the ground floor as he also serves as the cashier. Yummy cheese! I love it. I love quesong puti! I prefer the ones made with vinegar(soft) and not with rennet(firm) …. and also not fried. The flat square ones I brought to your beach house before sells for P25 each….still the same price now but a little thinner :( I agree with ConnieC that the lost of agricultural lands is directly proportional to the decreasing number of carabaos thus the high price of producing this yummy delicacy. Betchay, that is so cool. Carabao’s milk kesong puti is something we don’t have in Davao, so I am always on the look out for good ones whenever I’m in Manila. But yes, the prices have been increasingly shocking. Cheese lover here.. I love it !! Wiki says, 1 pound of cheese requires 10 pounds (or about 5 quarts) of cow or goat milk and about 6 pounds of sheep milk. Local cheese, usually cheddar, is reasonably priced here (in Canada). Mozzarella, Ricotta and Mascarpone however, are three or four times more expensive. Almost identical price difference between fresh pasta and fresh wonton noodles made from the selfsame Canadian wheat flour. I eat a healthy dose of mascarpone with my low carb diet so I just make my own mascarpone from whipping cream on sale and probiotic yogurt. We love pan de sal in the toaster oven, slightly toasted then kesong puti put on the bread and back into the toaster until nice and hot. Mango jam, Santos jam, raspberry jam spread on the hot cheese. Yummy!!!! I’m originally from calinan Davao but it seems so difficult for me to buy the kesong Puti..it’s locally made here but where the exact store for kesong puti??? ?